Suit up for a close-up look at bees during a hive dive, get sticky extracting honey, and fill up on wine, cheese and honey all while overlooking the gorgeous Keller Estate vineyard. The family-friendly day will be topped off with a silent auction of bee related goodies. 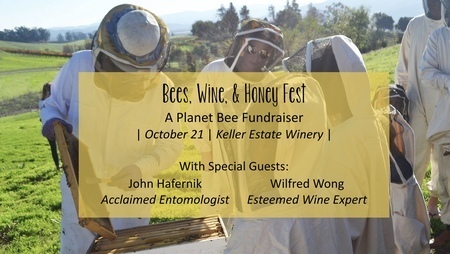 Special guests will include Wilfred Wong, renowned wine expert with over 40 years industry experience, and Dr. John Hafernik, nationally acclaimed entomologist and San Francisco State University professor emeritus. Since 2015, Planet Bee Foundation, an environmental education 501(c)(3) non profit, has worked within the Bay Area building community and awareness around the plight of the bee by teaching in schools, working with local farms, community gardens, and nonprofits, forwarding green initiatives in corporations, and engaging with the general public. Their mission is simple: to empower and educate the next generation of environmental stewards through individual action. Each year, Planet Bee teaches their hands-on Environmental-STEM lessons to 5,000 students, exposing them to the world of environmentalism. Last year, 91% of schools Planet Bee taught at received full program sponsorships thanks to generous donors. Join them during this exciting and important event, as they raise funds to continue offering program sponsorships to schools in need. Purchase tickets for the event at kellerestate.com/Shop/Gifts-and-Events. $50 for adults, $12 for children. For more information on Planet Bee Foundation, visit planetbee.org.